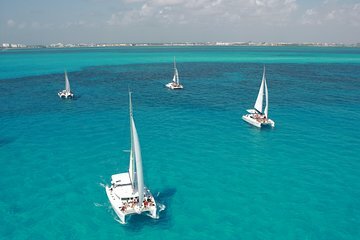 Enjoy a scenic sailing tour of Playa del Carmen with a guided catamaran cruise to Isla Mujeres. Once you arrive, stroll along the island's pristine beaches, then put on snorkeling equipment to explore the Manchones reef and its unique underwater statues. Lunch at a beach club, refreshments, and round-trip hotel transportation are included at no extra charge. Same place where you will be pick up.